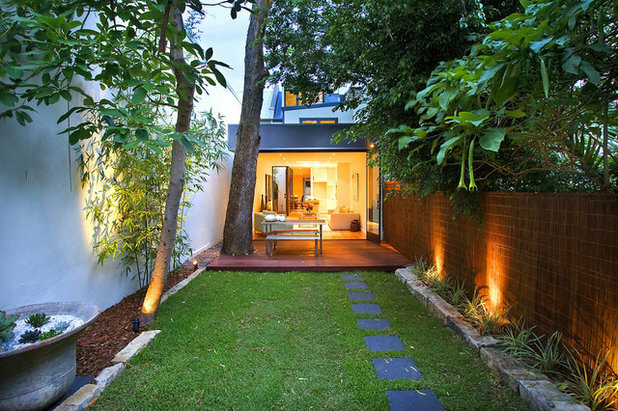 Houzz Australia Contributor. 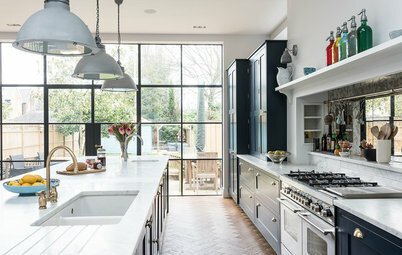 Former staffer at Home Beautiful and Country Style. 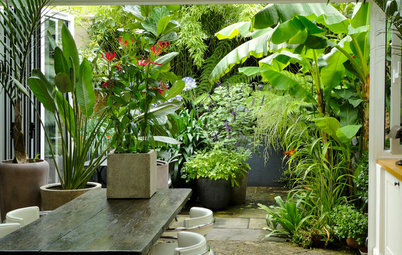 Travel, healthy cooking and indoor plant enthusiast. 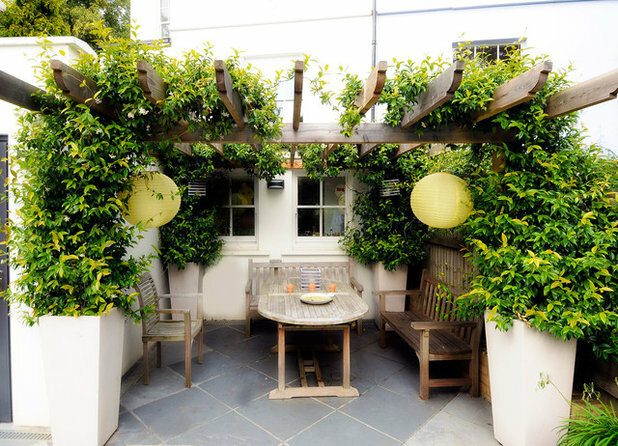 Whether you have a cosy courtyard filled with hanging planters or a sprawling jungle, your garden is the perfect place to invite friends when the sun is shining. 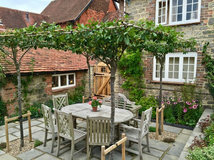 Try these ideas to tempt guests outside, but be warned – they might decide to hang around all summer. 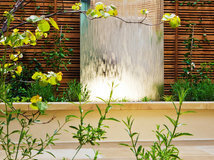 A cool respite from the midday sun is essential for daytime activities in the garden. 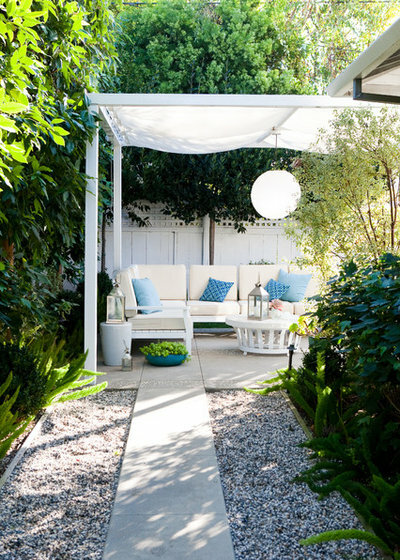 A shade sail or plant-covered pergola will add hours to your entertaining time. 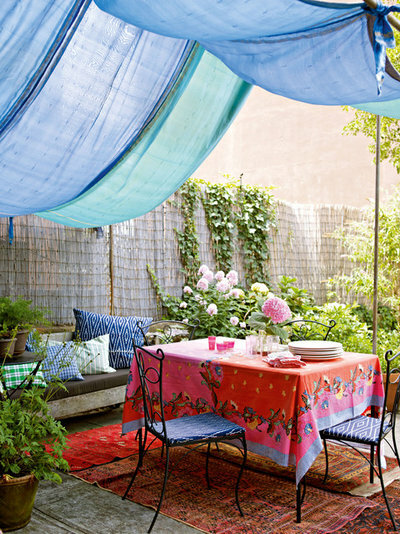 For something less permanent, an oversized beach umbrella can come in handy for beating the heat. 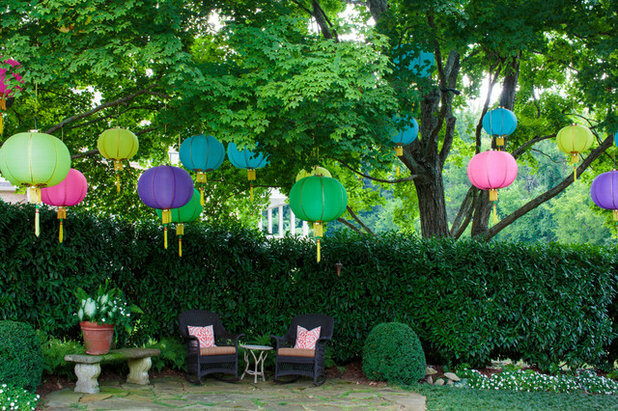 Tip If you’re lucky enough to have large trees in your outside patch that provide shady spots to sit, jazz them up with colourful bunting or lanterns when you’re hosting friends. 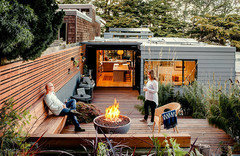 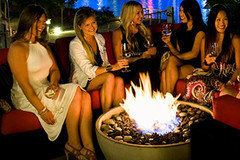 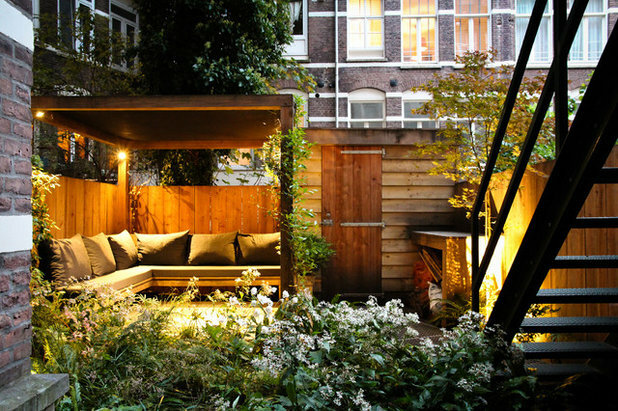 Getting the seating right is a sure-fire way to ensure your garden is a comfortable place to linger. 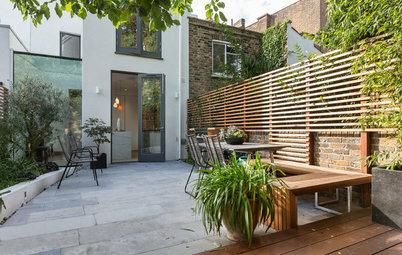 If you don’t have a dedicated outdoor seating area, fold-up chairs and sunloungers will work a treat and can be packed up and moved inside during bad weather. 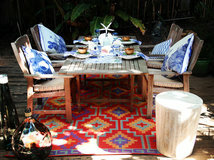 Tip Mismatched pieces create a fun and relaxed vibe, especially if they’re low-lying. 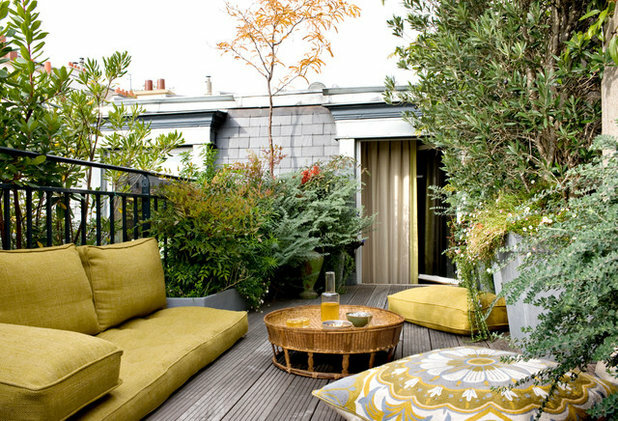 Think beanbags and comfy, oversized cushions – perfect for an afternoon of lounging. 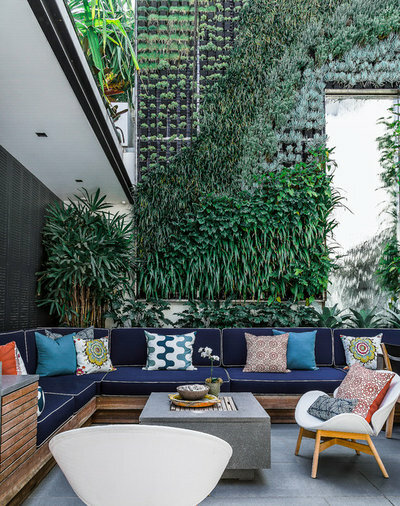 Whether it’s a living wall overflowing with tropical ferns or a softly trickling water fountain – even a fire pit or a swinging hammock – an eye-catching feature will help to grab guests’ attention and draw them outside. 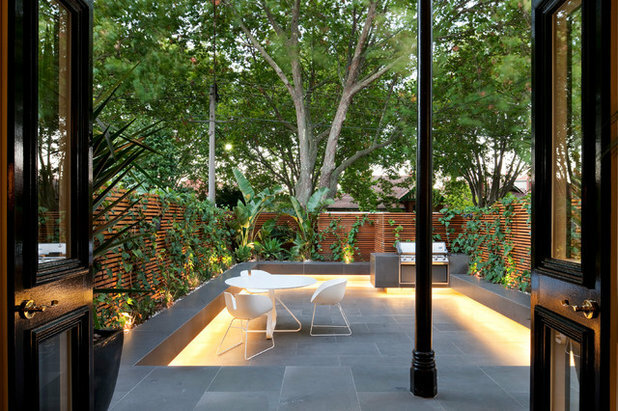 Tip An uplighter positioned at the base of a tree can turn it into a stunning feature, not to mention helping your guests find their way after dark. 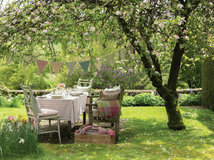 Make the most of glorious summer days by dining outdoors. 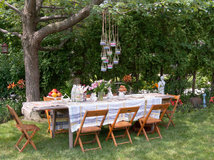 Dress up a tired-looking table with linen, candles and fresh blooms to create a sense of occasion at every meal. 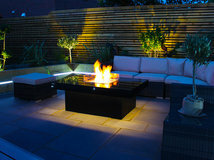 To ensure your outdoor space remains a hive of activity after the sun goes down, consider different lighting options – from task lighting to feature lighting – to create the perfect evening glow. 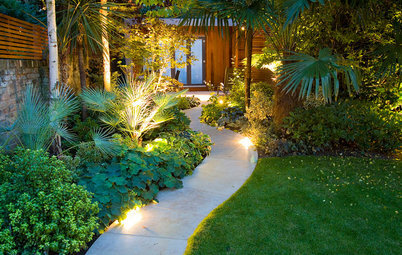 Whatever style you decide on, make sure your lights are designed for outdoor use, even if your garden area is semi-covered. 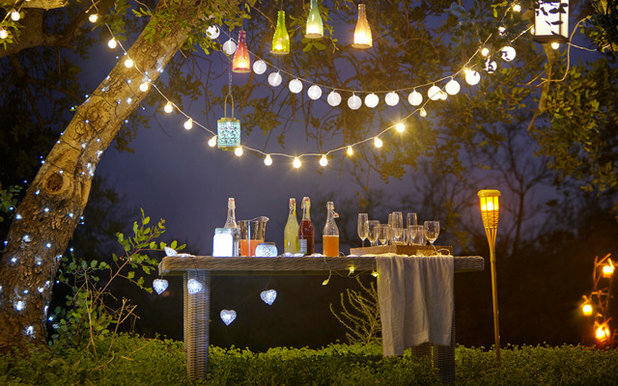 Tip Solar options are a great choice for lights located further from power outlets, and fairy lights are a fun and inexpensive way to create a festive vibe. 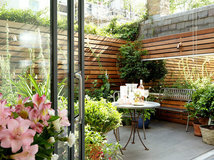 Entertaining in the garden is easier when it feels like an extension of your living area. 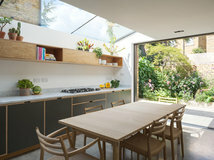 Bifold doors are the perfect way to open up a living room when the weather is fine, unifying your garden with an indoor entertaining area and encouraging guests to wander outside. 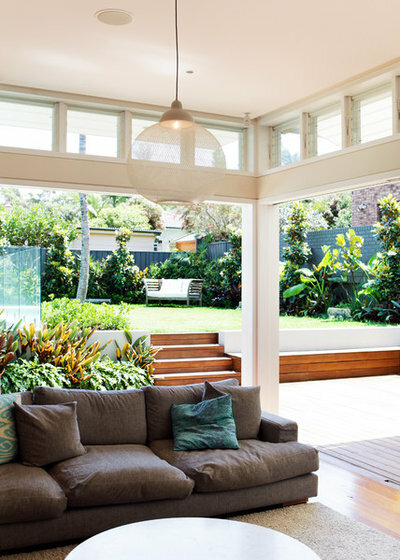 Tip Consider also using classic living room items such as rugs, sidetables and cushions in the garden to blur the indoor/outdoor boundaries. 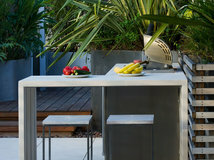 Quick and easy is best when it comes to warm-weather food – think grilled meats with freshly tossed salads – and a barbecue would be a welcome addition to any outdoor patch. 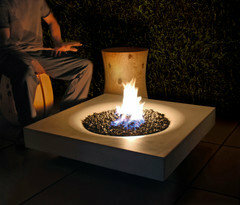 Pick up a portable option and see how quickly it becomes the social hub of your home. 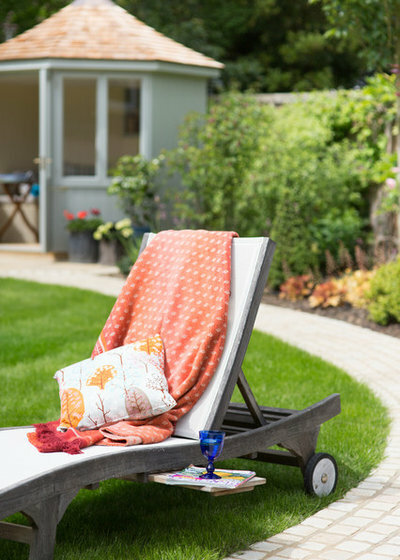 Soft furnishings can instantly bring cosiness to an outdoor area – think cushions, throws, tablecloths and outdoor rugs in vibrant hues. 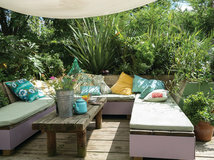 Turn your garden into an exotic hideaway with Moroccan-inspired patterns or complement the greenery with lush, palm-inspired prints. 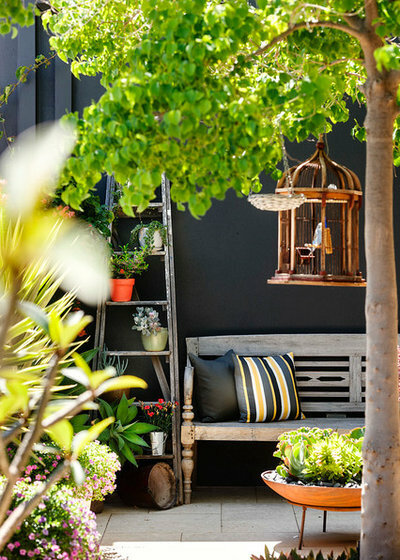 Tip Gardens aren’t just for plants – colourful pots, bird feeders, cool vintage pieces and decorative lights all help to create a space that’s fun and inviting. 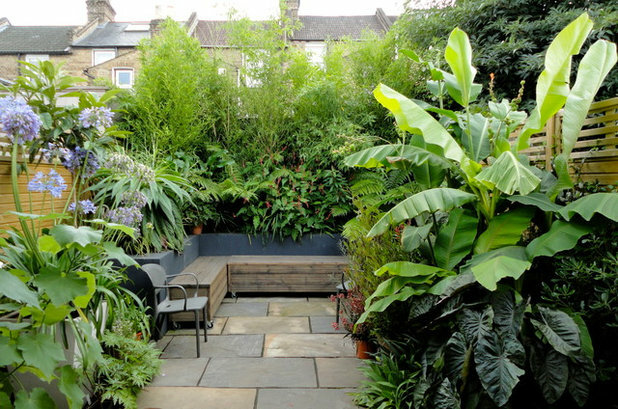 Surrounding your garden with a wall of plants creates a feeling of warmth and privacy that’s perfect for hosting intimate get-togethers. 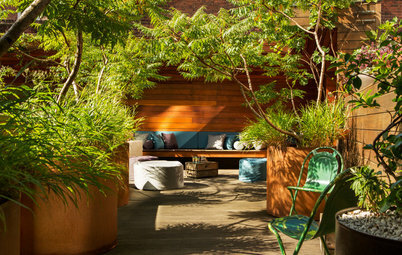 A great option is the versatile and fast-growing bamboo plant – a tall and sturdy stance makes it ideal for creating a green screen. 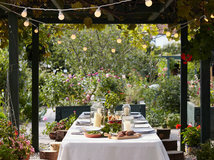 Tip Make an outdoor dining space feel extra special with a pergola, which allows greenery to grow over and surround your table. 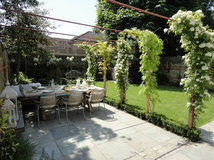 Go for plant varieties with colourful blooms such as wisteria and bougainvillea. 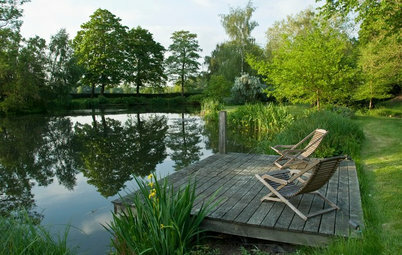 How do you tempt your guests outside? 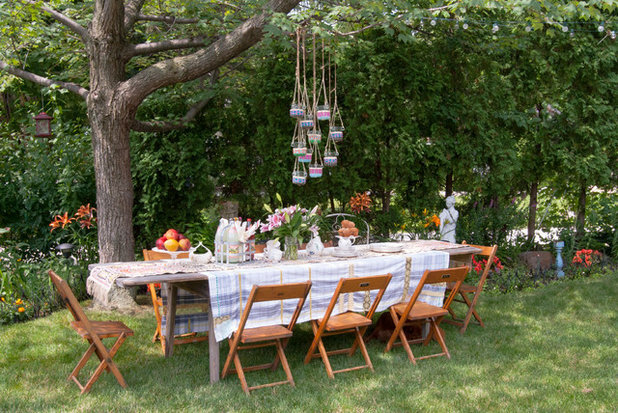 Share your summer entertaining secrets in the Comments below. 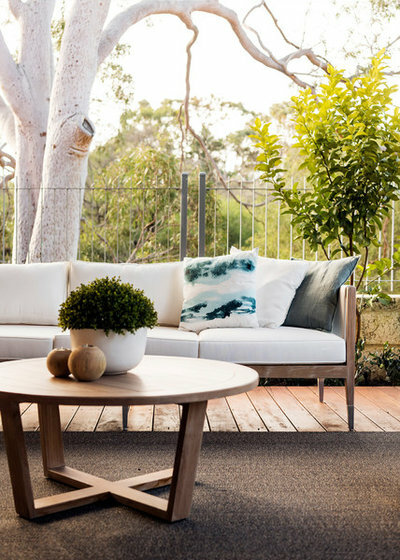 Most Popular Ask an Expert: How Do I Choose the Perfect Patio Flooring? 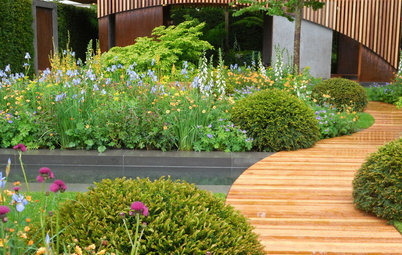 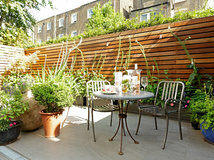 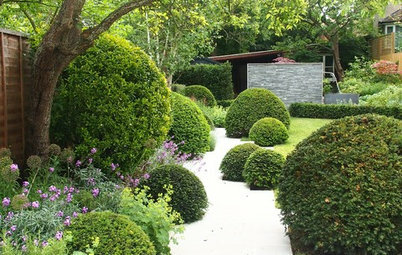 Garden Design Which Outdoor Seating is Best for Your Space?